The Amazink Live Show has been reimagined as Amazink Lite. New performances began on 20 May and will take place every Friday night until the end of June. “Talented local performers entertain with an energetic, interactive performance which promises to have you out of your seat by the end of the night,” Amazink said in a statement. 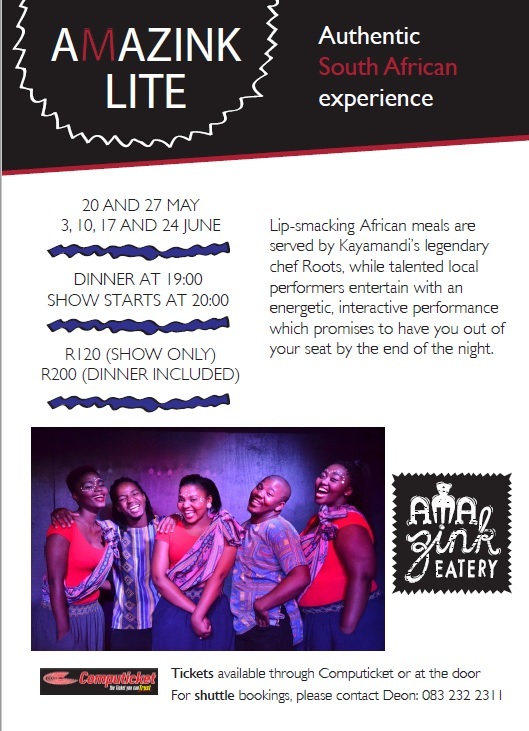 The performers include O’Ryan Winter, Khanyiswa Joyi, Anele Mrali, Sibongiseni Wani, Lungulethu Menzi and Lelethu Zulu. The next show takes place this Friday at 20:00. Stop by at 19:00 to enjoy a meal prepared by renowned Kayamandi chef Roots: the menu includes ribs, chicken wings and chakalaka. The next show dates are: 3, 10, 17 and 24 June. Where: Amazink, Masitandane Street, Stellenbosch.